Domestic violence doesn’t end when a victim gets “out,” it just switches tactics. The final participant in our Communication Challenge knows that better than anyone. Day in and day out, their own demons trick them into repeating the battle they’ve already won—only difference is, this time, it’s not in person. Perpetrator #4: The Appeaser is ruled by fear; usually a victim of physical and/or emotional abuse. Modus Operandi: Long exchanges in which the abuser attempts to regain ground, while The Appeaser attempts to…well, appease him. These conversations are typically much lengthier and frequently followed by a series of desperate, “emergency” phone calls to her attorney. 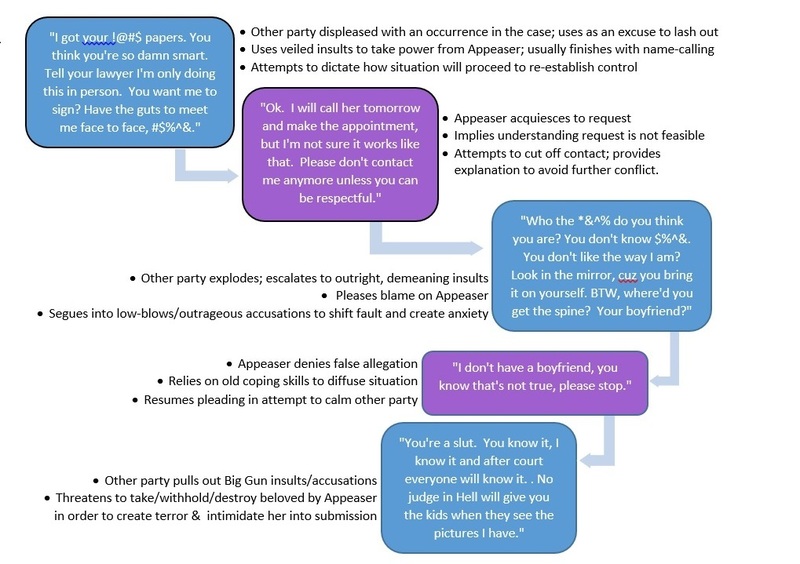 Numerous survivors of abuse fall into a communication spiral so predictable, it was easier to make a flow chart than try to describe it narratively. What The Appeaser doesn’t realize is they are living the Self-Fulfilling Prophecy. 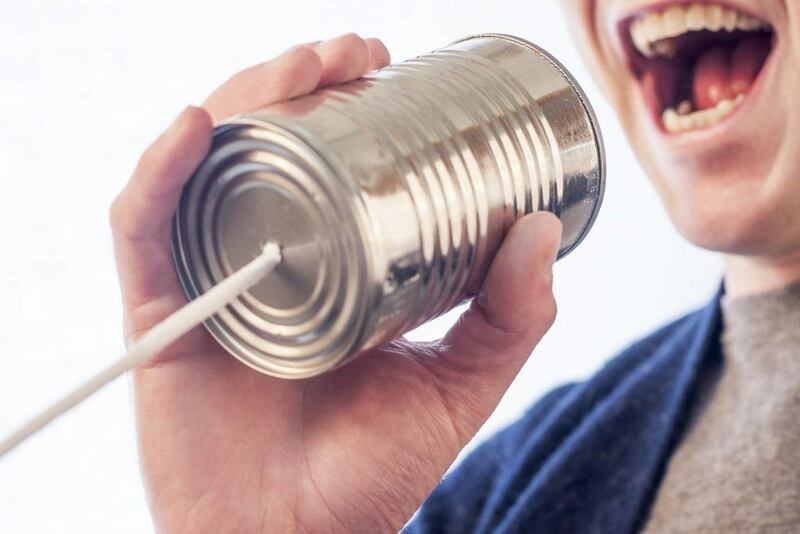 To elude the inevitable onslaught of violent and demeaning texts, e-mails, and voicemails, they fall back on old habits like placating their Ex by soothing and pleading. Yet by responding, they open the door for just that. In the end, The Appeaser inadvertently contributes to the creation of the very situation they are trying to avoid. In many cases, The Appeaser lived for many years in a world where they had no voice, no power, and no self-worth. Their Abuser stole all of that—beat it out of her either literally or figuratively. Because most victims of abuse suffer forms of Post-Traumatic Stress Disorders, the volatile communication spewing from their estranged spouses triggers a learned response. This is the case with the Appeaser; it’s how they get manipulated into a trap like the one above. Survivors of domestic violence have difficulty recognizing their own strength returning. They have been isolated and broken for so long, they don’t realize the courage they’ve demonstrated by leaving the situation. The Appeaser needs time. Time to let the dust settle. Time to learn to stand up straight again. Time to be able to stop looking over their shoulder. Once they do, they’ll realize they take control. They can get their power back by disengaging. The worst sound a bully can hear is silence. Without an audience, he’s got no leverage. What does a loudmouthed windbag do when no one’s there to listen? He shuts the heck up. If you’re The Appeaser, burst your abuser’s bubble with a snap of your phone. I realize this is a lot to ask—but as I said, it took guts for you to get out. Don’t belittle that by continuing to be a doormat in a fresh, new way. In fact, you could relish forwarding the irrational e-mail littered with profane and impugning your character to your attorney; bring on the vulgar voicemail you’ll play over and over in court, and let the nasty text messages scroll in– take a screen shot and tell him thanks for the trial exhibits. What will he have? A whole lot of respectful nothing. You’ve already been brave—now you need to be smart too. Rehabilitation: “You should be speaking to your attorney. And you’re violating the restraining order.” Buh-Bye.